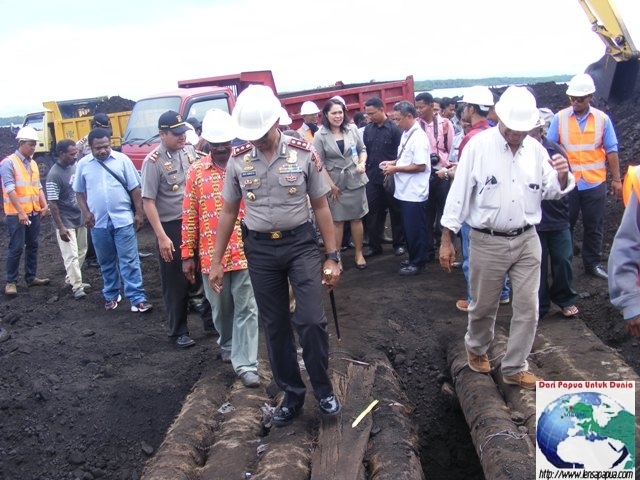 The first ever shipment of coal was sent from the Arar container port in Sorong, West Papua Province, on Wednesday 11th June, according to a report published in local Sorong news media Lensa Papua. The 5,500 ton shipment was destined for Amurang in North Sulawesi, to be used as feedstock in a coal-fired power station there. The mining company mentioned in the article was PT Megapura Prima Indah. Although Papua is not facing the same amount of threat from coal mining as East and Central Kalimantan, there are nevertheless several areas under active exploration. As well as around Sorong, there is a huge area from Bintuni and Teluk Wondama stretching to near Nabire, several areas around Sarmi and Waropen, plus significant amounts in Fakfak and Mimika Regencies, as well along a band where the southern lowlands meet the central mountains around Yahukimo. From the latest data awasMIFEE has been able to get hold of (a map of mining concessions up to 2012), there were 115 coal concessions covering a total area of more than 3.5 million hectares! Of course the actual coal mines would be smaller than these exploration concessions, but nevertheless, it is clear that the coal industry in Papua could be considerable in the future. Just as with plantations, gold mining, and oil and gas, the potential for conflict and human rights violations associated with this industry is also impossible to ignore. This entry was posted in Around West Papua and tagged Batubara, Coal, Pelabuhan Arar, PT Megapura Prima Indah, Sorong. Bookmark the permalink. Comments are closed, but you can leave a trackback: Trackback URL.